As today’s storage environments rapidly evolve from rotating disks to SSDs—and from RAID controller silos to software-defined storage—so have techniques for optimizing various aspects of that storage infrastructure. However, unlike traditional techniques, with NVMe, it is no longer necessary to optimize for I/O characteristics. This paper compares storage optimization techniques still in production that optimized I/O characteristics, with contemporary techniques that optimize reliability. 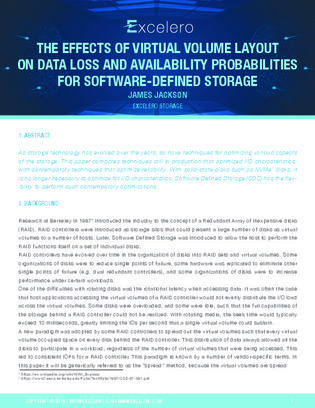 In particular, it examines if the virtual volume “spread” method is still needed in NVMe environments. Access the comparison here.